The National Hyperbaric Centre Ireland offers hyperbaric oxygen therapy for a variety of conditions. 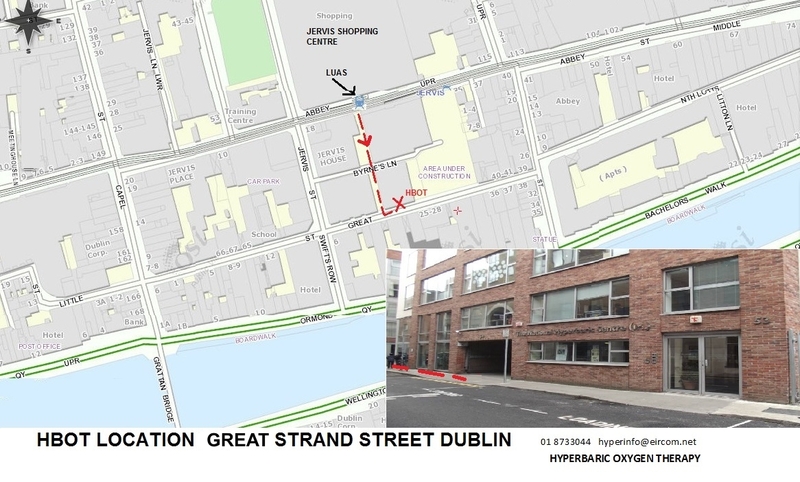 The centre’s staff are all members of the Undersea and Hyperbaric Medical Society and have been using Hyperbaric Medicine here in Dublin since June 1996 when we got our first ‘Mono-place’ chamber. Hyperbaric oxygen therapy (HBOT at 100% O2) is a prescription drug under European Directive 65-65 EEG 1/2004 and is the only non-hormonal medical treatment approved by the FDA for biologically repairing and regenerating human tissue. The National Hyperbaric Centre offers treatments for off-label use that have shown promising results for diseases and health issues that research suggests it may benefit. They include: closed head injury/concussion, stroke, cerebral palsy, autism, Lyme disease, swelling (oedema), joint-related issues, peripheral neuropathy syndromes/diabetes, poor circulation, reflex sympathetic dystrophy, complex regional pain syndrome, chronic fatigue syndrome, osteoradionecrosis, crush injuries, brain oedema, near drowning/hanging, acute hearing loss, radiation myelitis, soft tissue radiation necrosis, certain liver disease, and an average of 70% faster recovery following cosmetic/plastic/reconstruction surgery. Hyperbaric oxygen therapy is defined as the subjecting of patients to oxygen breathing at ambient temperatures which are greater than normal atmospheric pressure. Although concepts of hyperbaric oxygen therapy were first employed in 1662, its modern use other than for decompres­sion dates from 1956 when hyperbaric oxygen was used to perform cardiac surgery in Holland. Mechanically, the most common applications of hyperbaric oxygen are to dissolve air or gas emboli and treat divers with ‘bends’ or decompression sickness. New insights into the biochemical and immune interactions of hyperbaric oxygen have increased interest in its potential applications over the past decade. The United States Medicare system, the Food and Drug Administration (FDA) and The European Committee for Hyperbaric Medicine (ECHM) have approved hyperbaric oxygen for 14 different indications ranging from acute carbon monoxide intoxication, gas gangrene and osteoradionecrosis to acute peripheral arteriolar insufficiency. The National Hyperbaric Centre has a spacious 11 person Therapeutic chamber (low pressure, twice normal pressure, 2 AtA for sports injuries and wound healing etc.) and a 10 person Decompression chamber (high pressure for diving related injuries …. “The Bends”). Hyperbaric Medicine and Irish Doctors.